Democracy has prevailed. The sky hasn't fallen in. I'm critical of many aspects of the EU. As a kind of medium-soft leftie I think the EU has become too right wing in the last decade but one reason I have long liked the EU is because for a long time it dampened nationalism. Since the EZ crisis it has really only fertilised nationalism again so it only has itself to blame for this. Let's see where it ends up though. Europe was slower to recover than the UK, but the UK recovery is fragile, imbalanced and debt-fuelled. The EU is growing again. In the UK itself I think poorer people have been duped into voting against their best interests, but who am I to argue in my relatively comfortable London bubble? And so on, not to mention NI and Scotland having to abide by a decision they voted against. An Honours system that knights people like Philip Green and Lynton Crosby - the Australian who orchestrated the same fear campaign in 2015 that Cameron used in the referendum, and whose firm orchestrated an overtly racist mayoral campaign against Sadiq Khan. This referendum had nothing to do with respect for popular concerns. It was all about Cameron trying to control some headbangers in his own party. He put his party before his country, and his party won. Now a bunch of neo-con nutters like Gove (who privatised public legal aid funding to the poor)*, Liam Fox et al are being given the keys to the country. Boris has no principles, he's just a self-interested egotist, out for himself only. The EU - despite its faults - provided the governance checks and balances that the UK lacks. Without the EU there is no effective governance mechanism to protect the UK from its own undemocratic and illiberal instincts. That's why I voted Remain. *and in fairness Gove's prison reforms make sense. What checks and balances? Zero hours contracts? The EU did nothing for the people. One of the reasons they rejected it. It could not really be any worse than it is. The EU protect nobody from anything, that is the problem. You seem to think it is some sort of Guardian angel, but all we have seen is rising inequality in the UK whilst in the EU. As you yourself point out, Gove privatised public legal aid funding to the poor, were was the lovely EU to protect the poor? Fact is many people had nothing left to lose. "Without the EU there is no effective governance mechanism to protect the UK from its own undemocratic and illiberal instincts." "Within the EU there was no effective governance mechanism to protect the UK from its own undemocratic and illiberal instincts." Really the EU has done next to nothing. Worker have been stripped of pretty much every right one way or another. Maybe it will bring about an early General Election? All that remains is for someone to have the guts to stand up and say that Brexit is unachievable in reality without an enormous amount of pain and destruction, that cannot be borne. And David Cameron has put the onus of making that statement on the heads of the people who led the Brexit campaign.If Boris Johnson looked downbeat yesterday, that is because he realises that he has lost. Last edited by The Fly; 26/06/2016 at 3:24 AM. I was thinking that earlier, that instead of of a second referendum they could try and do it another way, by calling a GE and making EU status the #1 issue. A fairly huge majority of the current Parliament were Remain voters. Complete garbage, no workers rights in Britain via their domestic Parliament since 1979. The only ones imposed have been via the EU. The devolved governments have also had their cases rejected, meaning there is no legal requirement to consult them on Brexit. Essentially, it means they won't have a veto and their will can be by-passed by Westminster. Former SNP leader Alex Salmond says a second independence referendum in Scotland was "very likely" if the government rejected its amendments to the Article 50 bill. He said very few people voted for Britain to withdraw from the European market place, and his party is set to table 50 amendments to the proposed legislation. Mr Salmond said if the government decides "to bulldoze" the bill through the House of Commons, does "not take on board any of the amendments put forward" or is not interested in the compromise proposal for Scotland "to remain in the single market place and ensure Scottish jobs and prosperity, then I think in Nicola Sturgeon's words 'an independence referendum becomes very likely'." He added: "If Theresa May throws down the gauntlet, Nicola Sturgeon will pick it up." Some politician in the North there just suggested a second referendum, just caught the end of a news item. Any idea who it was or which party? I don't think that would go down well across the water. There's pretty much no chance of it happening. Neither Labour nor the Tories would entertain the notion of having a second referendum. Labour's position is pretty much, "Yeah, we supported Remain, but we have to accept the will of the people now." And they sort of do for their own survival as a credible force in English politics; if Labour pursued the Lib Dems' route of demanding a second referendum, I'd only see them losing further votes to UKIP. If the Union is to persist, I do still think regional exceptions or special arrangements should be made as the political culture and climate in England is vastly different to that in Scotland and the north of Ireland. What the English might think of as good for them (although I doubt the utterly-bonkers idea of a hard Brexit will have a silver lining), will very certainly be disastrous for Scotland and Ireland. May won't visit the North before triggering A50. Not like her to not keep her word. A thoroughly useless PM. Looks like they pulled her out of her coffin for that second photo. I'll send them some nails so that she never comes out. I actually can't get over the sheer arrogance. I mean, i get that the Tories are arrogant and am kinda used to the concept given their history, but I'm flabbergasted that they just keep moving the goalposts on their arrogance. David Davis on QT last night talking about immigration is a case in point. Actually, is it arrogance if you're completely devoid of ability, intelligence and you're all at sea? Shocked that the BBC didn't state that she "narrowly" won. In other news, the Tories have indicated that they are going to block the vote until the 2020s. Are they seriously that inept? [b]ut Mundell has told the BBC that the government does not see the 18-month timetable (the expected timetable for the talks - because up to six months may ne needed for ratification at the end of the process) as significant. Instead, he implied that the government would not talk to the Scottish government about a referendum until, not just Brexit, but until the transitional period was over too. That would put back a referendum until into the 2020s. Here's the video. Mundell is a cretin. This is a tweet that was below Mundell's. Classic. Last edited by BonnieShels; 28/03/2017 at 5:41 PM. 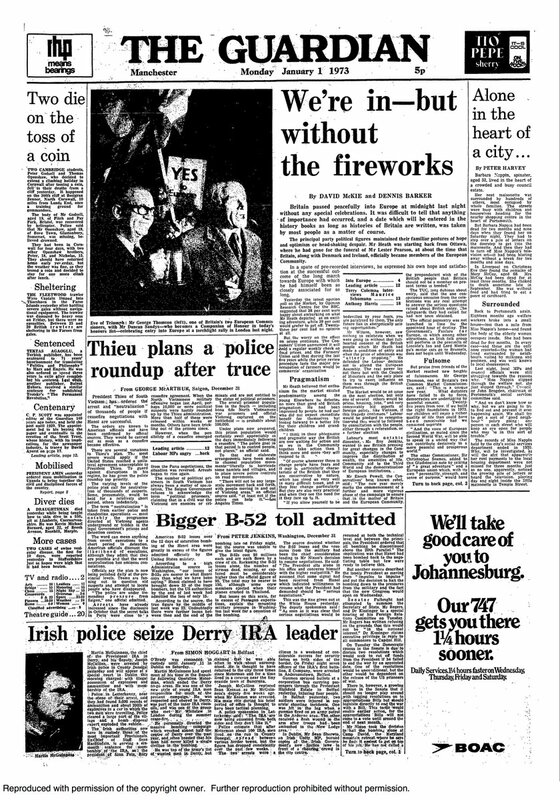 Interesting piece at the bottom left as Martin McGuinness was arrested the day before by the Gardaí in Letterkenny. v. In particular, we must pay attention to the UK's unique relationship with the Republic of Ireland and the importance of the peace process in Northern Ireland. The Republic of Ireland is the only EU member state with a land border with the United Kingdom. We want to avoid a return to a hard border between our two countries, to be able to maintain the Common Travel Area between us, and to make sure that the UK's withdrawal from the EU does not harm the Republic of Ireland. We also have an important responsibility to make sure that nothing is done to jeopardise the peace process in Northern Ireland, and to continue to uphold the Belfast Agreement. All signs are pointing towards Germany making Brexit talks difficult for Britain, just as it is about to trigger Article 50 and thereby starting the formal two-year negotiation process for the UK leaving the European Union. A deal that it probably will not be happy with. A deal less favourable than staying in the EU. The UK will have to pay the entire £50 billion (€57.3 billion) Brexit divorce bill or face being sued. Germany's finance minister Wolfgang Schäuble in Chancellor Angela Merkel’s close ally and said "we have no interest in punishing the UK, but we also have no interest in putting European integration in danger over the UK. That’s why our priority must be, with a heavy heart, to keep the rest of Europe — without the UK — as close together as possible." A draft document on the EU's Brexit strategy said no agreement on the EU's future relationship with the UK would apply to Gibraltar without the consent of Spain, giving it a potential veto. It wrote: "After the UK leaves the union, no agreement between the EU and the UK may apply to the territory of Gibraltar without agreement between Spain and the UK." Brussels officials were quoted by the Guardian as saying the EU was standing up for its members interests. "That means Spain now," a senior EU official told the newspaper. "Any extension of the deal [after withdrawal] to Gibraltar... will require the support of Spain. [The text] recognises that there are two parties to this dispute." This really is fast becoming a nightmare for the UK. Ireland got prominent mention in the Guy Verhofstadt press conference after the vote and a promise that there will be no hard border will be a boon to border businesses desperately worried about their future. In a considerable coup for Ireland, the border issue is at the top of the priority list. The European parliament president Antonio Tajani also mentioned its predicament saying that the Good Friday Agreement, like the EU four freedoms, must not be touched. A slightly contemptuous looking Tajani said Farage needed to show respect to democratic structures. “We don’t have here mafia [or] gangsters,” he said. Great news. I assume this is the EU acknowledging the special circumstances of the north and pretty much saying that special status is a reality/possibility, as far as the EU is concerned. If the UK government similarly has no interest in imposing a hard border in Ireland - as the likes of Theresa May and David Davis have been claiming - then they'll presumably place the effective UK-EU border around Britain.